Just as Gutierrez was blowing kisses and waving to her adoring fans she was informed that it was actually Miss Philippines Pia Alonzo Wurtzbach who had won the crown instead. 'The first runner-up is Colombia,' he announced. Wurtzbach joined Gutierrez on stage as they both stared into the audience in shock. Miss Universe 2014 Paulina Vega gave her fellow countrywoman a comforting pat on the back. 'Folks let me take control of this,' Harvey told the sea of boos and cheers. 'This is exactly what's on the card,' he then said, displaying the results on the camera. 'I will take responsibility for this, it was my mistake,' he continued. 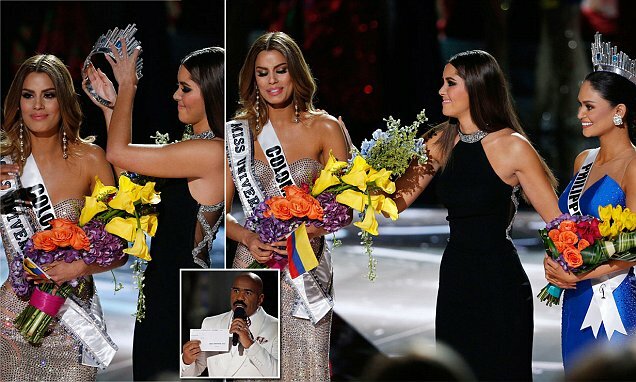 'I can show it to your right here, the first runner-up is Colombia. It's my mistake, still a great night. Please don't hold it against the ladies.' 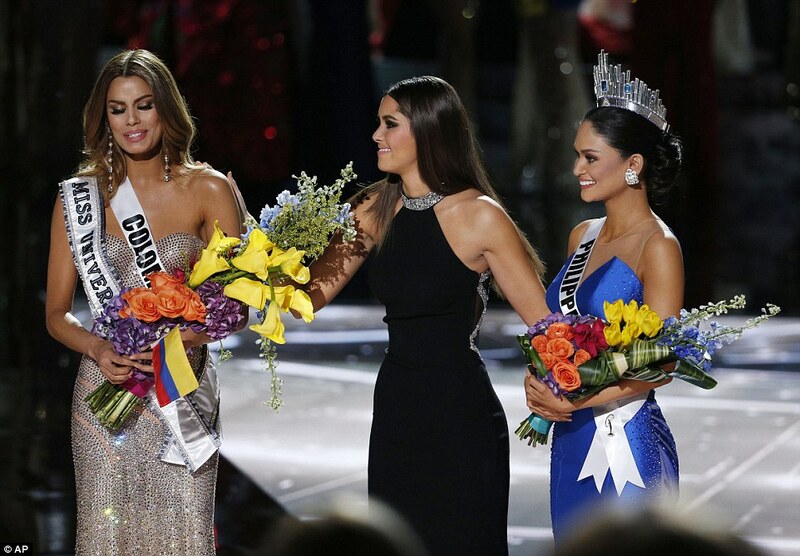 And then came for the heartbreaking moment when Miss Colombia had to bend down, allowing Vega to remove the crown and place it on Miss Philippines head instead. The telecast then came to an abrupt stop, cutting without credits or allowing Miss Philippines to take her first walk as Miss Universe. Harvey immediately tweeted after the show, spelling both women's countries wrong as he tweeted: 'I want to apologize emphatically to Miss Philippians and Miss Columbia. He then deleted the tweet and re-wrote it, saying he felt terrible and apologized 'wholeheartedly to Miss Colombia and Miss Philippines' for his 'huge mistake'. 'I don't want to take away from this amazing night and pageant. As well as the wonderful contestants. They were all amazing,' he continued to tweet, before once again 'emphatically' apologizing to Gutierrez and Wurtzbach. Social media is heavily criticizing Harvey, but he has found an unlikely ally already in Harry Styles. 'Stop sending hate to Steve. At least he apologized and admitted that he made a MISTAKE. Stop being so immature,' tweeted the One Direction singer. The Miss Universe organization released a statement following Harvey's mix-up. 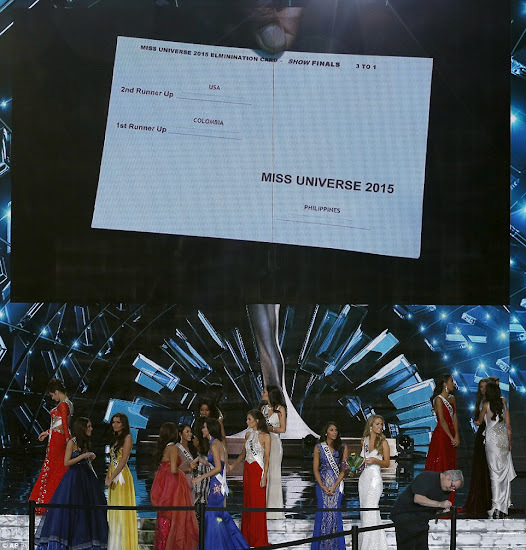 ‘The excitement of live TV was evident tonight on the Miss Universe stage with over 10 million live fan votes tabulated,’ the organization said in a statement posted on its Twitter account. Miss Colombia was wiping away tears backstage when she was asked if she had a message for her fans - and she assured them she was happy. 'Everything happens for a reason,' she said as fellow contestants hugged and comforted her backstage in the video tweeted by the official Miss Universe twitter account. Wurtzbach called the moment 'very 2015' in a video released by the pageant. 'It's a very...non-traditional crowning moment,' she said, struggling to find the right words and clearly still in complete shock as Jordan gave her a comforting hug backstage. Wurtzbach competed in the Miss Philippines pageant for three years before she won the opportunity to represent her country in the Miss Universe pageant. Harvey's mistake was the final twist in the three-hour pageant that sometimes felt more like a reality show. The host revealed at the beginning of the event that for the first time in Miss Universe history the audience would have a voice, their real-time votes counted with the scores of the judges, actress Nicey Nash, blogger Perez Hilton, former Miss USA Olivia Culpo and football player Emmitt Smith. But it wasn't until Harvey read the name of the top three that he shared that there was actually be one more secret judge. Or 77 of them to be exact, specifically the very women they had just spent the last three weeks in Vegas with - who now stood behind them. 'Sure hope you've been nice for the past three weeks,' Harvey said. The pageant began with the beloved national costume competition, where there were more feathers than a Victoria's Secret fashion show as the women came out in extravagant looks to represent their countries.